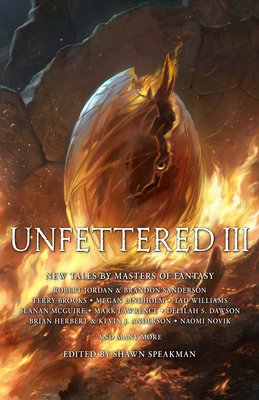 From the editor of the award-winning anthology Unfettered comes the newest installment in the science fiction and fantasy series, Unfettered III. Lacking health insurance when he was diagnosed with cancer, Shawn Speakman asked friends in the science fiction and fantasy writing community to donate short stories he could use to counter mounting medical debt. The result was Unfettered, an anthology offering tales from some of the best authors working today. Now, in Unfettered III, Speakman continues to pay forward the aid he received, raising money to combat medical debt for SF&F artists and authors. He has gathered together a great mix of new and favorite writers--free to write what they like--the result a powerful new anthology perfect for all readers. Unfettered III is sure to astound with the magic bound within its pages. All the while raising money for a charitable cause. Because protecting our artists and authors is as important as the stories they tell.